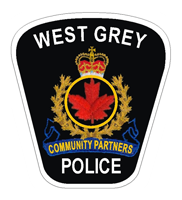 On Sunday February 10th 2019, the West Grey Police Service received a call regarding a West Grey Municipal truck, parked at the Ayton arena which had the licence plates Ont#974-OWH and a roof light bar (amber flasher) stolen. Entry had been attempted but not gained to the vehicle. The investigation is ongoing and anyone with information can contact the West Grey Police Service at 519-371-6911 or Crime Stoppers at 1-800-222-8477 www.cstip.ca. Sometime between the 10th and 11th of February 2019, culprit(s) stole a ’08 CRMT 818 18’ flatbed trailer, with white steel rims, bearing Ont#L2301Z from GREINS Automotive on Victoria St in Ayton. Investigation shows there was some activity in the area at approximately 3:30am. Investigation is ongoing and anyone with information is asked to contact the West Grey Police Service at 519-371-6911 or Crime Stoppers at 1-800-222-8477 www.cstip.ca. On Monday February 11th 2019, between 7am and 8am an employee of a local concrete buisness reported that a white company truck, (2014 Ford F150 4×4 bearing Ont# AH34915) had been stolen from their Grey Road 12 business (Glenelg Twp). There was a diesel fuel tank with a yellow pump in the box of the pick-up truck. This investigation is ongoing and anyone with information is asked to contact the West Grey Police Service at 519-371-6911 or Crime Stoppers at 1-800-222-8477 www.cstip.ca. On Wednesday February 13th 2019, police attended an address on Park St in Durham and subsequently arrested two adult males on outstanding warrants held by West Grey Police. The first male was arrested for break and enter, possession of stolen property over $5,000 (x 2) and possession of stolen property under $5,000 (x 3). The second male was arrested on warrants for outstanding provincial offences. Both males were delivered to the Walkerton Courts for their respective bail hearings. On Thursday February 14th 2019, West Grey Police were called to attend a snowmobile trail in Allan Park where a burned out Nissan Versa had been found. The investigation of this vehicle is ongoing and anyone with information is asked to contact the West Grey Police Service at 519-371-6911 or Crime Stoppers at 1-800-222-8477 www.cstip.ca. On Saturday February 16th 2019, the West Grey Police were called to attend Sideroad 20 South of Concession 18 in Normanby. Upon arrival police recovered a stolen flatbed trailer and a Kawasaki Mule UTV. Both vehicles had been stolen earlier in the month from a Grey Highland business. There are suspects associated to these vehicles and the investigation is ongoing. Anyone with information can contact the West Grey Police Service at 519-369-3046 / 519-371-691 or Crime Stoppers at 1-800-222-8477 www.cstip.ca. For the week of 10–16 February 2019, the West Grey Police responded to 5 motor vehicle collisions. With our inconsistent and ever changing weather with the freezes, thaws and squalls all drivers need to be aware of the continuous change in our area’s weather and road conditions. For the most up to date road conditions, please contact the Ministry of Transportation by dialing 511. Please do not call 911 for road conditions. The West Grey Police Service will be hosting our third annual Special Olympics Polar Plunge on March 1st 2019 at St Peters St Pauls Elementary School in Durham. Plungers are asked to raise a minimum of $50 to have the “honor” to take the plunge. Last year, we were able to raise approximately $10,000 and we are hoping to match that this year! Create your teams and get ready for one of the most satisfyingly cold experiences of your life. For more information, visit http://www.polarplunge.ca/plunges/westgrey or contact Cst. Cory Trainor at 519-369-7762.